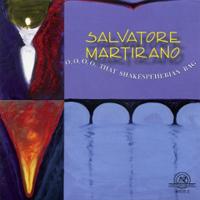 Salvatore Martirano (1927-1995) was a composer of instrumental and computer music. Not only that, he was an actual Professor of Music at the University of Illinois for over three decades! (In fact, if you stacked up all of the papers that he graded over the years, they would stretch all the way from Earth to the Van Allen radiation belt.) In case you recently got hit on the head with a five pound block of cheese and now have amnesia, UI was a hotbed of electronic and computer music back in the 1950s and ’60s, with the likes of Lejaren Hiller, James Tenney, Kenneth Gaburo, Herbert Brun and others brewing up groundbreaking works regularly. This here O, O, O, O, That Shakespeherian Rag compact disc collects instrumental works that span all the way from 1959 to 1979–from the era of real malt shops to fake ones on Happy Days. Licking, I mean kicking off the program, “Cocktail Music” fills the room with the kind of dissonant solo piano plonk that might make Conlon Nancarrow grin. “Octet” ruffles everyone else’s feathers with a round of super-quirky chamber music via bass clarinet, flute, contra-alto clarinet, celeste, violin, cello and bass marimba. You are currently browsing the archives for the Salvatore Martirano category.